Assalamualaikum. For the second proofread, the thesis had to be in a Microsoft Word format which made me do wish it is possible to compile the LaTeX file directly into a Microsoft Word format instead of having to convert file formats. There is a conversion method that uses the Terminal but for reasons i've no idea of, it didn't work for my thesis. Counting from the title page to the last page, the thesis is 115 pages thick at the moment. The main contents (abstract and chapters) are about 60+ pages while the rest are the supporting contents (appendixes, bibliography, etc). In the form of a PDF file, the thesis takes up 20.8 Mb of disk space. The website managed to convert my bulky document very well. When i opened the converted document in LibreOffice Writer, it looked almost exactly like the original document. The tables were garbled though. I don't know how it will look when opened in Microsoft Word. And the converted file was only 6.9 Mb. 1. Go to the Convert PDF to Word (http://convertpdftoword.net/) website. 2. In my FireFox browser the Choose File button is truncated (see Pic 1) but not in Chromium. Click the Choose File button. In my case i clicked the field beside the button. A File Upload window as seen in Pic 2 pops-up. Pic 2 - Refer Step 2 and Step 3. The File Upload window. 3. In the File Upload window, locate your PDF file. Then click the Open button. See Pic 2. 4. Click the Convert and Download button. See Pic 3. 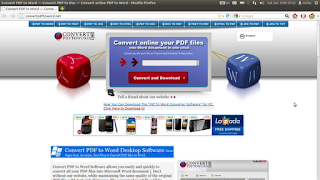 Leave the website to process (upload and convert) your file. This process might take some time. See Pic 4. Pic 3 - Refer Step 4. Clicking the Convert and Download button to initiate the upload and file format convertion process. Pic 4 - Refer Step 4. Processing the document. 5. Once the whole process is finished, click the Download button. See Pic 5. The Opening UploadedFile_###.doc window will appear. See Pic 6. Pic 5 - Refer Step 5. Downloading the converted file. 6. In the Opening UploadedFile_###.doc window, select the Save File option, then click the OK button. See Pic 6. Pic 6 - Refer Step 6. Saving the converted file. 7. Once the download is completed, open the converted file in LibreOffice Writer to check and see the results.